Our Christmas concert this year will be on Saturday 3rd December starting at 7:30pm. 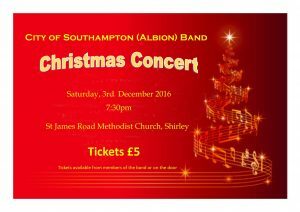 It is being held at St. James Road Methodist Church in Shirley. Tickets will be priced £5 and can be obtained from members of the band in advance or on the door on the night. 35 queries. 0.732 seconds. Zindi theme.